Sonoma County Water Agency service area. Map from Cardno Entrix Aquatic Assessment for Sonoma County Department of Health Services. The Sonoma County Water Agency (SCWA) is primarily a Water District, a local management users’ cooperative, concerned chiefly with the collection, distribution, use and contracting for surface and ground water. 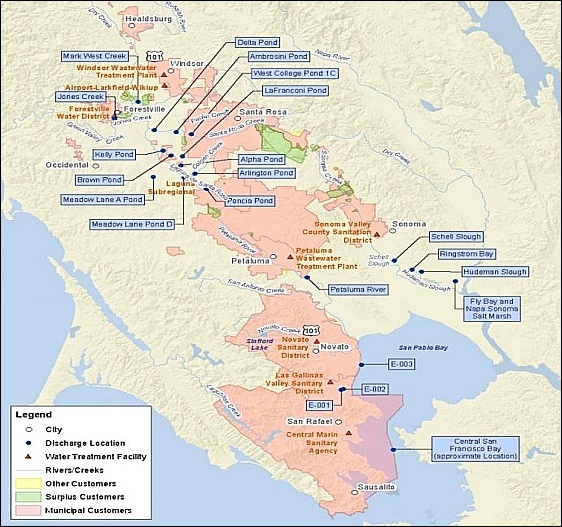 SCWA is largest local water district, the wholesale domestic water supplier to 280,000 residents of Sonoma County, 225,000 residents of Northern Marin County, 195,000 residents of Marin Municipal Water District, and 35,000 Mendocino County residents for a total of 735,000 domestic water users. SCWA’s customers include its eight main retail contractors: the City of Santa Rosa, City of Petaluma, North Marin Water District, Valley of the Moon Water District, City of Sonoma, City of Cotati, Forestville County Water District, and the City of Rohnert Park. The Restructured Agreement for Water Supply is a detailed agreement by and between the Sonoma County Water Agency and each of those customers. The unanimity required by the Restructured Agreement took eight years to achieve, and the Agreement may be amended only with the consent of all signers. Additional SCWA customers include: Ya-Ka-Ama, Santa Rosa Jr. College Agriculture Farm, Sonoma County Probation Department, Sonoma County Airport, Redwood Fibre Glass, Sis-Q Flying Service, California Division of Forestry, Nation Flight Service, Inc., Redwood Aviation Enterprises, Larkfield Water Company, County of Sonoma, Victor S & Mark H. Trione, Lawndate Mutual Water Company, Kenwood Village Water Company, Sonoma State Hospital, Penngrove Water Company, Feather Knoll Farm, Marvin Malacredi and C. H. Christensen, and Marin Municipal Water District (MMWD). Flood Control: SCWA monitors and manages stream flows in the Russian River and its major tributaries, and plans, constructs, and maintains a system of flood control, drainage and waterway facilities. 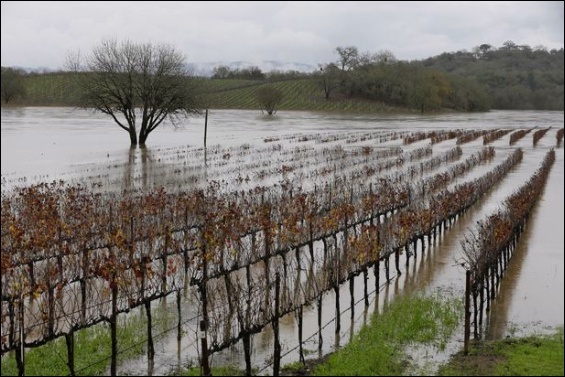 SCWA oversees75 miles of engineered flood control channels, primarily located in the vicinity of Santa Rosa, Rohnert Park, Cotati, Petaluma, and Sonoma. The Agency also has easements to maintain hydraulic capacity over approximately 100 miles of modified or natural channels. With the County Planning Department, the SCWA created and manages a program to monitor and regulate gravel extraction from the Russian River and its major tributaries. Working with local soil conservation districts, the Agency develops and administers programs for erosion control, and the protection and restoration of riparian corridors. In addition SCWA conducts reviews and inspections of drainage and erosion control plans for land development projects. Sanitation: As of early 1995 SCWA’s responsibilities extend to include construction and regulation of sanitation facilities, an industrial waste program; a grease, oil and sand interceptor program and an enforcement program. At the same time, SCWA employees became a part of the Permit and Resource Management Department. The County staff in charge of engineering & design of wastewater and recycled water treatment plants and collector systems were folded into SCWA. The move means that SCWA employees now fall under Civil Service Guidelines, like employees of all other County agencies . SEE the SCWA Wastewater Treatment Process Interactive Map. The Russian River Biological Opinion is a federally mandated 15-year blueprint to help save endangered ­fish and ensure our water supply. The Sonoma County Water Agency (Water Agency) has created the Russian River Instream Flow and Restoration (RRIFR) Project to implement the mandates of the Russian River Biological Opinion. At the direction of its Board of Directors, the Sonoma County Water Agency is soliciting public input on proposed strategies for addressing long-term water supply problems presented by regulatory requirements, endangered species and changing weather conditions. Possible strategies to address the challenges facing the water agency include updating a state regulatory decision on water flows in the Russian River, known as Decision 1610; evaluating the impacts of climate change on water supply; exploring opportunities for storing winter water underground to be used in the summer (known as “groundwater banking”; and working with the county and cities to implement low impact development standards. Learn more about SCWA’s Water Supply Strategy Action Plan.